I believe that I’ve read every post you’ve written about shirts. Italian, Spanish, British, even the one on Charvet in How To Spend It. I’m always looking for the same thing but still haven’t found it. Maybe I missed one, maybe I didn’t. What makes a quality shirt? Not fit, but the construction specifications that make quality. Are collars and cuffs fused or how are they supposed to be made? What parts need to be hand stitched? What are the materials that get used to make a quality shirt? How does a quality shirt manage to hide the top button flap underneath the tie knot (poor quality shirts always seem to show some cloth and don’t allow the tie to sit between both sides of the collar). I really hope you can help me with this because I’ve been puzzled by what makes a quality shirt for a long time and haven’t found any proper answers yet. Anywhere. It’s a good question. One reason you haven’t found much so far is that there isn’t that much to the make of a shirt – at least not compared to a suit, or a bag. 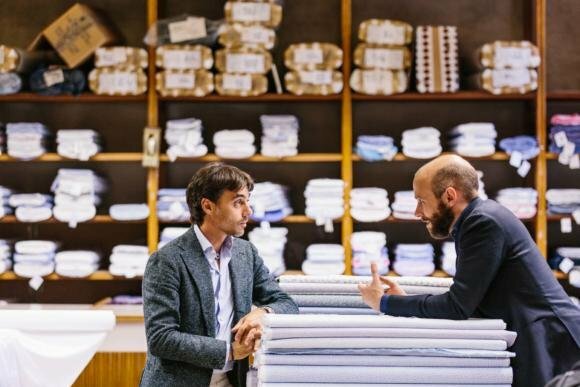 In fact, it’s interesting that when most retailers talk about a high-quality shirt, they often mean the opposite of what the customer wants. The brand is offering a fine shirt, with more delicate material, whereas the customer wants something that will last well. The most important things by far in a shirt are fit and style, not quality. Still, it’s worth running through the quality points to provide context: to explain what difference each makes, and which are subjective, which objective. The fabric of a shirt is a big area – indeed one we’ve written a whole Guide to. However, most of those points are about design, style and formality. The actual quality of a good shirting – in terms of how it will wear over time – doesn’t vary that much. If anything, more expensive fabrics tend to be made of a finer (thinner) cotton which makes it lighter on the skin but also more delicate (like big Super-number suitings). It can also give the cotton a sheen that is rather showy. You generally want a two-ply cotton, but only something around 80-120 thread counts – often written as 2/80 to 2/120. And most basic shirts will have that. Mother of pearl is nice, and certainly preferable to plastic. But where that mother of pearl comes doesn’t matter much, and more expensive ones just tend to be chunkier, which again is rather showy as well as being a little annoying to button. As with many of these areas, what men want most is just buttons that will last and not break – and everything apart from the cheapest plastics is fine there. Some shirts have more stitches to the inch, single-needle stitching, and French seams (where the material is folded over three times and then sewn together very closely). Functionally, having more stitches to the inch is stronger, but it makes little real difference to longevity. I’ve had fairly cheap shirts for years and the side seams have never opened. It’s more aesthetic – neatness that you might want if you’re not paying (a lot) for hand sewing these seams. But then, you might not. These are the little bits that end the side seam at the bottom, stopping it coming apart (below). As with fine stitching, they are often listed as a sign of a quality shirt, but I’ve never known anyone whose shirt has split there. Sometimes the side seam on a shirt and the sleeve seam don’t line up, because the sleeve has been turned to change its pitch. This is certainly a functional aspect, but I’ve worn shirts with it and shirts without, and never noticed a difference. When you attach a cuff to the sleeve, there is excess that must be taken in somewhere – as the cuff is smaller than the sleeve. 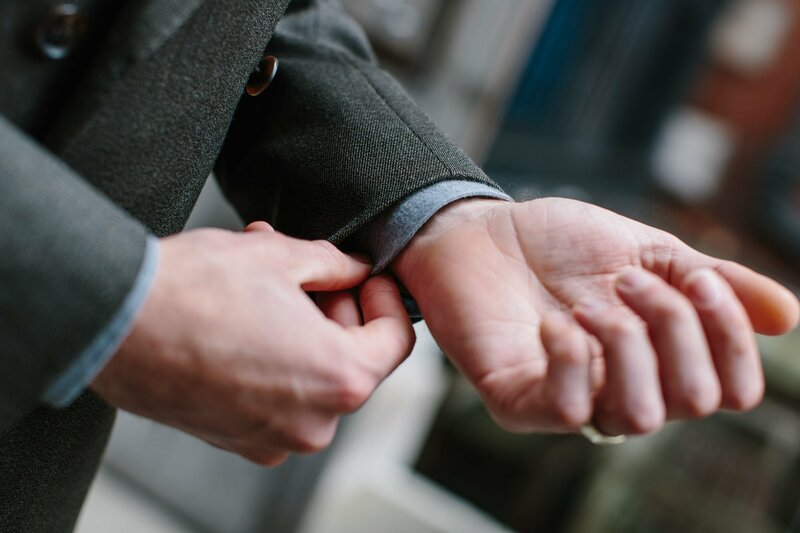 You can do this through a few pleats, or in consistent gathering around the cuff like some Neapolitans do (below). The latter is harder, but in no way better and too effeminate for some. 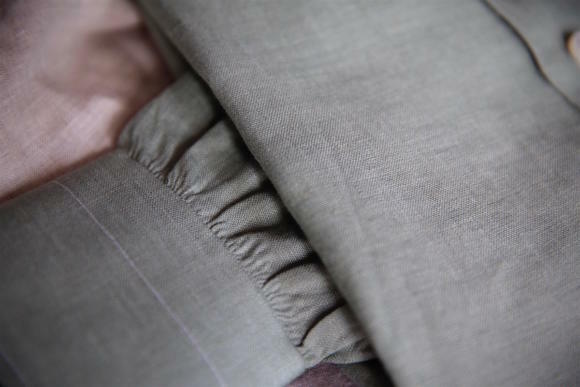 There is an argument that pleats can throw fullness into the right places – perhaps around the elbow, where you need room – but it’s very minor. 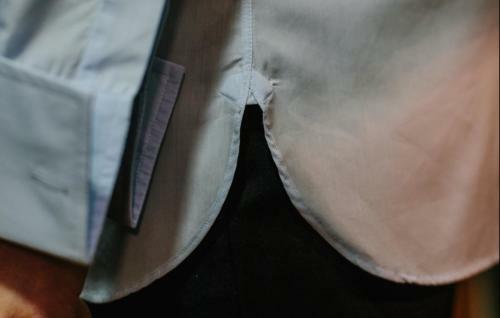 This is where a lot of money is spent at the top end of luxury shirts: hand-sewn buttonholes, hand-sewn buttons, hand-sewn side seams, hand-finished bottom hems, hand-attached plackets. These are mostly purely aesthetic, and I would only recommend paying for them if you want the look. Some hand sewing can be functional, and in my view worth paying for in an expensive shirt. One is having the collar attached by hand, while the shirt body is on a mannequin and the collar fastened, so the whole thing is done in the round. This gives the collar a natural roundness and curve, and makes it less likely to collapse when worn. The second is having the sleeve attached by hand. This enables a better fit as a larger sleeve can be worked into a smaller armhole – fundamental to bespoke tailoring as well. It also makes it easier to do a wider seam around the sleeve, which can be more comfortable. A floating lining to a collar is often listed as a sign of quality. But whether you want one or not is largely a style choice – it’s just that a floating lining is harder to make. Personally I find floating collars uncomfortable when buttoned and too ready to collapse when open. A good fused collar will not bubble when wet, or in any other way age badly, and it curves naturally around the collar of a jacket. It is more likely to require collar stiffeners when buttoned, however. A lot of the points I’ve said are relatively unimportant are best used as short-hand for the general care that has been taken in the making of the shirt. Care is important. If buying a brand for the first time, there may be weaknesses in the way the shirt is sewn that you can’t see easily – such as the way the thread is knotted off after a button is sewn on. But then again, a manufacturer may also add fancy gussets in order to distract from all the shortcuts he has taken elsewhere. Buy shirts for their fit, then their style, then functional hand-sewing. And look after them. Don’t dry clean; hang dry; tackle stains quickly. Most shirts get stained long before their side seams rip. The point you make, Simon, about not hiding the collar button when worn with a tie, is one of design rather than manufacturing quality. It may be that cheaper brands put less thought into this, but then it may also be that they use a different standard shape that doesn’t work for your particular neck. You can follow the discussion on How to buy a quality shirt by entering your email address in the box below. You will then receive an email every time a new comment is added. These will also contain a link to a page where you can stop the alerts, and remove all of your related data from the site. Simon, I see you’ve used an image from Drake’s who now own Cleeve of London. Do you know if Drake’s are just using the name ‘Cleeve of London’ for their MTM shirts? Because as I understood it Cleeve made shirts in quantity for other brands and were not a ‘one off’ MTM shirtmaker (please correct me if I am wrong). Finally, have you ordered a shirt yet from Drake’s since they acquired Cleve of London, if so how was it? Thank you for your help. Hey Dominic – yes Cleeve are carrying on making for other brands, and I’m actually in the process of having a bespoke one made, so watch this space! Other than the odd shirt you wear which seems to be ‘perfect’ – see your post dated 22nd August, for me most shirts seem to have their own inherent problems. With me it is the rolling of the collar tip when wearing a tie which is made worse by using a collar pin but why is this occurring? In your blog mentioned above, your shirt sits high and is perfect even though you are not wearing a tie. As this is another problem i have with shirts (they lay flat) I thought i may come up with my own solution to have a press stud or button and tab concealed under the collar that could be used when not wearing a tie so that it keeps the collar up when wearing a jacket as they always seem to splay open and disappear under the jacket collar which is very unattractive. Any help on this problem would be appreciated other than bespoke as it is out of my budget range. Bradley, I’ve found Hilditch & Key shirts to be my end-all shirt, and having tried to get them copied in Hong Kong, I’ve realised why. The secret collar stiffner! Shirtmakers can copy the exact details of stitching, collar shape and size, and position of the stiffner-inserts, but a Hilditch & Key collar has a very thin and quite soft ‘stiffner’ embedded in the very front edge, that goes from the collar point, to about 5/8″ from the top. This serves the purpose of avoiding collar-point-curl, which happens with Tyrwhitt, Pink, etc. but more importantly it keeps the bottom part of the collar stiff enough to stand on its own, almost vertically out of the top of a jacket, when worn without a tie. I’ve worn these shirts for over fifteen years without realising this one detail of construction until I tried many times to copy it, and failed. I’ll also add that a H&K shirt stands apart from most in that the collar is quite deep. i.e. 2″ at the back, so it sits quite high up the neck, which looks good, and also helps with the structure when worn tie-less. This is a really good summary post! I like the fact it allows a layman (‘me’) to rapidly ‘value’ the important vs unimportant when judging price vs value in a plain English style. I know there will be lots of people who read this who will say purchase “efficiently” priced shirt for the office vs. something a bit more special for their own wedding and will want to know what to look for and where to spend the money. As someone who has always wanted to try the finest out there and then dial back down on the curve of diminishing returns to something that I believe is a give more ‘value’, I have found the above really useful and think it could be the start of a good sticky thread similarly written on the major areas e.g. shoes, suits etc. that then link to your more detailed posts on the more subtle nuance found in bespoke items. Thank you again for the blog. Don’t dry clean? May I ask why not? 1. What sort of detergent, pre-treatment, wash cycle, temperature etc is best? 2. What about ironing (what sort of iron, how wet the shirt, any recommendation as to method)? 3. Other relevant points for care – eg avoiding sweat / yellow stains around the armpits, crunchy armpits (caused by deodorant?). Hi Simon – ‘high street’ shirts which are your favourite/best value? I haven’t tried enough to have a view I’m afraid, and not for a few years. Thank you for another excellent and very practical article that will help men immensely in understanding what’s important to consider about shirts. Simon thank you very much for answering this. It’s all clear now. One last thing, do you know which brands have a floating interlining collar? I’m guessing Kiton, Charvet, Borrelli…maybe even Steffano Ricci? I only own Kiton and Charvet, but no: Italians tend to be fused, so Kiton and Borrelli will be fused, and probably Ricci. Charvet is floating. I have read with interest all that you wrote and I agree with most of your comments (but not all). I just want add a note to your comment on italian collars: some artisans in Italy still make the not fused collar. They haven’t big names in the world, but they are really artisans with a ancient work processing. Thanks for your very interesting blog. On first reading this post I went “Wow!”. Because it succinctly and honestly addresses the broad and detail aspects of what to look for when buying a shirt. You even , dare I say , very bravely contradict what I believe you’ve written before. These matters are quite rightly inconsequential. Even most of my high street shirts of many a year are in good repair. The only thing I find is that shirts look tired and faded with time. And to this end I’m surprised you say material doesn’t matter. I would think in this regard it does. Your thoughts? From what you’ve written I’ve concluded that a TM Lewin or M & S or Charles Twyhitt shirt of a good fit would out do the need for bespoke. Unless of course someone is beyond an average fit. Finally, thank you , thank you for addressing this subject so honestly and so well as it can be read by anyone regardless of budget. A master class on the subject. Please, more frequent articles like this. Shirts are unlikely to wear better with more expensive materials. More important is looking after them well (no dry cleaning, no tumble drying etc) and simply having enough of them – wearing them every week simply means they will wear out fast. I’d still advocate bespoke, if you are anywhere near considering a bespoke suit. But the best value bespoke (eg Satriano Cinque with only functional hand work), or good MTM if you can find a process that produces a good fit for you. Simon – have you got any views on/experiences of Boggi’s shirts? I’ve tried most of the rtw offerings on Jermyn St and, for me (which is of course personal and body-specific), they stand out for doing slim or “tailored” fit in a slightly closer fitting way than the English makers. Fit aside, however, I’m not that impressed at all. I remember ironing a Boggi shirt some time ago and noticing a “Made In China” label! I checked the few shirts from them that I have and it’s ubiquitous. As the RRP is somewhere between £69 and 99, I’d expect more than this for the money. Also, I’ve noticed that the Boggi shirts don’t have spaces for collar stiffeners – they appear to have something sewn into the collar instead. Is this an Italian thing? (I’ve notice this in a couple of New & Lingwood casual shirts but haven’t seen it anywhere else) Or is it just a money-saver? From my experience, it doesn’t seem to help the collar keep its shape that much. I fear Boggi is a case of style over substance/manufacturing quality – a little bit like Brooks Brothers in that regard. This really is a fascinating subject that can be discussed and debated ad nauseum I’m sure. For example, today I have on a a Zegna shirt that was made to measure for me from the company’s su misura custom line. The fit is excellent and the construction appears to be very well done. The collar and sleeve attachments I’m sure were done by machine, yet feel very soft and look nice and rounded. The buttons are great and attached beautifully,but again by machine. I’ve had this shirt for four years and have laundered it properly and rotated its wearing as you suggest. The net result being that the shirt still looks fantastic. Points well taken and all true. I just ordered two test shirts from a company here in the U.S. called Individualized Shirts and am looking forward to evaluating this MTM product. Have you found a MTM system that you’re please with and can recommend? Do you mind mentioning what MTM programs you’ve tried? It’s been a while but I’ll try to get a list. That would be great,thank you. Thank you for one of the most informative and important posts I have seen on the internet fashion sites. For me, material is important for comfort and how it falls on the body, but I am glad to hear it isn’t a matter of life or death. And thanks for a great website, written for and by adults. I have noticed a lack of bad English and juvenile slang that you find on other men’s fashion sites. Blame years as a professional journalist..
@ Rollo “And thanks for a great website, written for and by adults. I have noticed a lack of bad English and juvenile slang that you find on other men’s fashion sites.” Agreed, and Very much appreciated, Simon. It’s refreshing to be able to swiftly read through and completely understand what you’re saying, without having to mentally add or delete letters, words, and punctuation in order to try to make sense of what you’ve written–that can be annoying and exhausting, especially in a longer, detailed piece. You are an exceptional journalist in this regard; I’ve read the writing of too many journalists who do not use good writing skills, not to mention improper use of I/me, who/whom/that, etc. I’ve, unfortunately, often been puzzled about why a few of the major blogs about style and elegance are written with poor grammar, spelling, and punctuation (I won’t go into slang or cursing). Should their attention to detail in style not extend to their written communication? Inexpensive and very good online-proofreading-software is available, and good online-proofreading services are available for around $25 an hour, or for rates by the line. 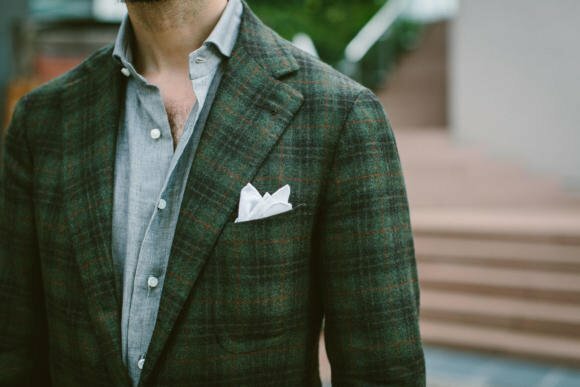 I would – and hopefully others – appreciate a unimportant/important list for jackets and trousers (separate as there is too much to cover under the broad term of ‘suit’). This is a great method and I agree with every point. Again, a really interesting piece. Could you do something like a test, where you would for instance compare a cheap and an expensive rtw shirt with a mtm and a bespoke shirt, putting all of them to regular use? Would you please address the issue of collar model? For example, is there a model that you recommend for a true dress shirt? Is there a model that works well with or without a tie? What’s your opinion of spread collars etc? 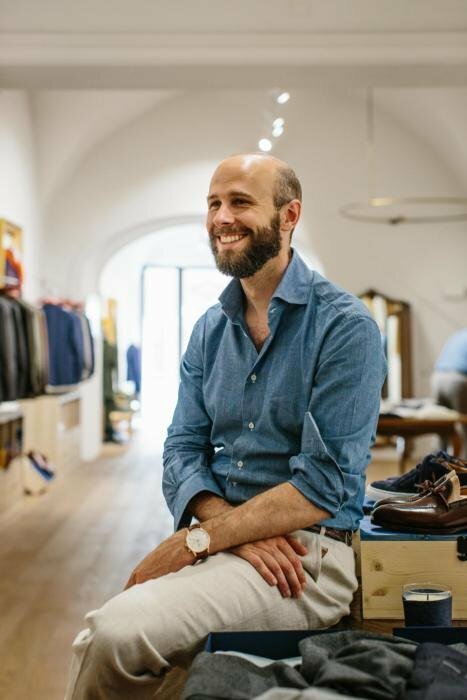 Simon, in London who do you recommend for bespoke shirts? I notice you’ve mentioned experiences with T&A Bespoke and Sean O’Flynn. How does the end product compare with bespoke shirts made on the continent (e.g. Italy)? Are there any major differences? Thanks for this Simon, always good to have a summary! Could you elaborate on your view that useful hand stitching would be to attach the sleeves by hand? In my experience and research, there is only the option to hand stitch the second stitching, the one folding back the excessive fabric into the shoulder. The main stitching, attaching the sleeve to the armhole is always done by machine for added strength, may it be with the big bespoke brands such as T&A or Charvet, as well as with the smaller makers I have come across here in Paris. Maybe Italians do it ? Q. “what makes a quality shirt” A. Love… I have my shirts made by Robert at Dege & Skinner along with his apprentice Thomas, every shirt they cut is a labour of “Love” and is shows. You aren’t a fan of the extreme cutaway? Is it too showy for you? I started wearing Purple Label Keaton collars this year and I think I am hooked…This despite a good friend jokingly calling the shirt a ‘negative spread collar’! Do you really mean that material doesn’t matter? And in your post on Johnstons of Elgin, did they really say the difference is all in the finishing and not the raw product? They know very well that there are vastly different qualities of raw cashmere. I remember years ago buying quantities of white 100% cashmere scarves from them at 50p a go, at the same time we were paying 30 times that for the Hilltop equivalent – believe me there was a difference in the raw material. Hey John, raw material certainly makes a difference, a huge one, but Graham’s point was that finishing is the biggest differentiator between companies. It’s worth stating particularly given that most consumers consider only the raw material, and never the finishing. And yes, sorry with shirts I do think material pretty unimportant. I was wondering if you could post what you consider to be the essencial pattern designs for dress shirts. In my modest english I’m aming at designs such as ‘bengal’, ‘gingham’ and so on. What are the textile patterns that you prefer? Thanks in advance. Very useful thoughts, Simon. THanks. Any solutions for rtw collars showing fabric instead of hiding the button under the tie? This is particularly a nuisance when wearing black tie, being narrower than a tie knot. Simon, you mention that material is unimportant but that does seem to rather ignore the reality of different climates and seasons (as well as the sensual pleasure involving in wearing certain materials). For example, I live in Hong Kong and I like wearing shirts made from a relatively heavy Thomas Mason twill in the winter but find it impossibly hot in the summer when I switch to Alumo Soyella, voile, or cotton / linen blends. This might not be such a big issue in Britain but in many other places around the world the choice of material will be crucial for comfort as much as for aesthetic reasons. Simon, thank you for your response. I’ve had a good read through past posts. 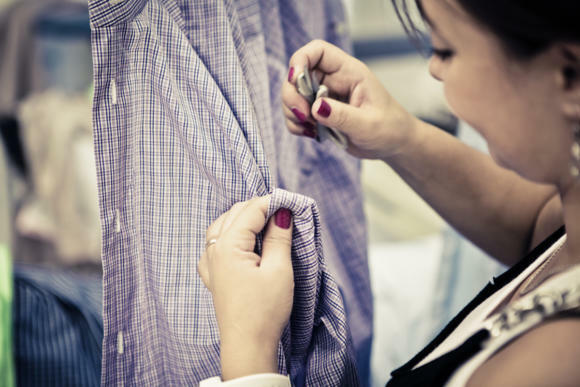 However, are there any particular bespoke shirtmakers you recommend in London? Not really Robert. I’ve used a few (all of which written on around the blog) but I don’t have shirts made in the UK anymore, so I couldn’t really recommend it. They copied a Hilditch and Key shirt for me. I just received a test fit shirt from Luxire. A light blue chambray button down collar. I used measurements from a shirt I own that fits very well. The fit is fantastic and the construction and finishing are very good. And the roll of the collar is beautiful. I am impressed and have already ordered a blue spread collar shirt to replace an aging one. I am lucky to have a body that fits RTW clothing fairly well, with the exception of shirts (sleeves are too short and armholes too large). With Luxire I’m finding that I can get shirts that fit well at a similar (or often better) price than RTW. And with such good results I don’t think I need to consider the more costly option of bespoke shirts. I did not mention, when referring you to Luxire, that the first shirt they made me was formed from Alumo cloth. They have also made me a pair of trousers from Dugdale cloth, based on some (quite detailed) measures from a pair of Graham Browne trousers. Both are outstanding in terms of fit and make, and at prices which you would simply not believe. It may be helpful to other readers if you were to explore a bit more widely. Thanks Nick, very interesting. Always trying, always exploring. I tend to only mention places I would recommend, but I am planning a few round-up pieces of places I wouldn’t. Thanks for the honest comments on shirt differentiation. Although I think you are going a little light on the importance of good shirting. The higher the super number the finer the thread but high quality shirting also has a better feel and lustre. There is a significant difference when wearing a typical high street 1/80 1/80 compared to a Thomss Mason 2/140 2/140. Thanks. There is certainly a difference, yes. I would argue that it is one of the least important things when deciding what to spend money on in a shirt, though, and certainly among the bottom few in a bespoke wardrobe as a whole. read about folded front hem somewhere. Is that a sign of a good shirt? And what about cuffs with an interlining(canvassed)? If you mean the hem at the bottom of the shirt, I’ve not seen that. If you mean the placket that runs down the front of the shirt, that’s not necessarily a sign of quality – it is a more formal style, and takes a little more work, but that’s all. what do you prefer between fused or unfused collars and cuffs? I know Bruce Boyer wears non fused shirts only. 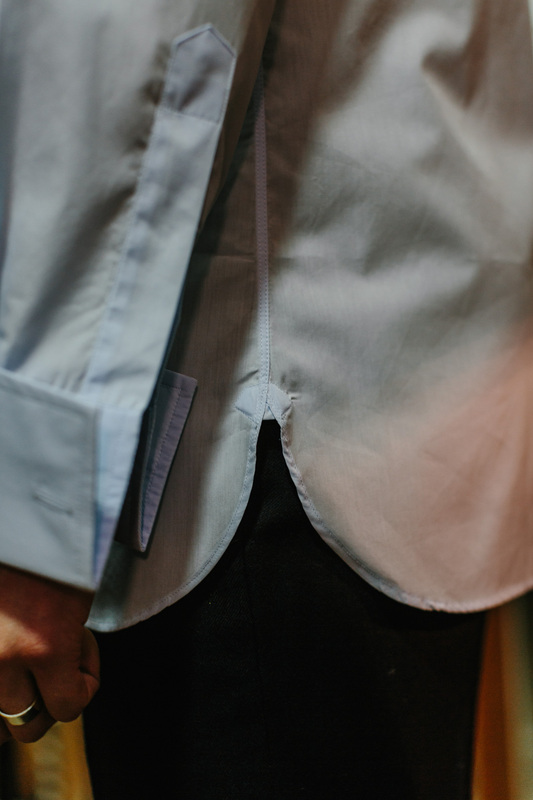 A non fused shirt is harder to iron and the collar will show more wrinkles instead a fused one will look stiffer. Maybe is better to opt for a non fused shirt for more relaxed shirts and fused for dress shirts with (for example) a french collar? do you have a picture of this tecnique? I didn’t get very well what you mean. I recently purchased a Eton shirt from Nordstrom Rack for $149.00 half of price of retail, but I returned the shirt because the collar stays were flimsy , sewn into the shirt collar and couldn’t be removed. I’m glad to part of your family of subscribers; I really enjoy reading your e-newsletter. For a quality shirt , fabric of the is also a important thing, i think so… online tailoring is a vogue today, so every one want to design their shirt via online using shirt design tool for a perfect fitness, fabric selection etc.. all these features are available in the shirt design tool. I wanted to know what quality of interlining is best for the fused collars(for formal shirts)? If you could share some specifications like weight or composition etc. Thanks Simon for an excellent article. What about collar rolls and collar stays? Any tips on those important points? What about cufflinks? What are the best cufflinks and collar stays producers if that makes a difference? Thank you. Cufflinks is a big area, see my collaboration with Diana Maynard for my views on the perfect pair. And there is little difference between collar stays. Plastic is fine, unless you like the idea of having something precious no one will see. Thanks again Simon, what about hand sewn cuffs and yoke (quarto spalla)? Don’t you think those are important to be done by hand? They don’t offer any functional benefit? Thank you so much. I do like using aluminum alloy collar stays. They can be given a gentle curve which I think adds a nice shape to the collar. Nearly every angle explored in this piece, except for the vexing question of whether one chooses a shirt made of ‘regular’ cotton or the non-iron variety. Clearly the labour saving of the non-iron, plus the benefit of still remaining crease free by going-home time, has its advantages. But are there disadvantages too? Breathability perhaps? What sort of magic treatment does the non-iron material undergo, are the chemicals used to coat the cotton safe and do they have any impact on the life of the shirt? Given that so much of what is available is now non-iron only, it would be really useful to understand the pros and cons. Do you iron your shirts yourself? If so, would you care to do a post on how you go about it? Please do. I’m sure a lot of readers, myself included, would appreciate and find it interesting. Simon, do you have a post that covers shirt thread count? No, but we’re looking at a series currently – should be available next year. Hi Simon – what do you think of shirts from Emmett? I bought some bespoke shirts, and after the first wash bubbles started to appears on the cuffs. Another bespoke shirt I own started to get bubbles on both cuff and collar after just a few wash.
Is that normal? Is there a way to get rid of those bubbles? If no, what should I do? I’ll bring this up with the tailor. I agrre, surely a good fusing hasn’t this problem, but surely a not fused collar never has this problem. My personal opinion is that glue ruin fabrics over time, just like starches and inadequate care. I know, not fused collars are not easy to iron and exactly how tradition is disappearing, people capable of managing traditional things are disappearing. But despite this I think it is worth the effort to take care of it, because, beyond all the processing, decidedly more complex that hides behind un fused collar, the difference is visible wearing it, as time goes on. Thanks for your experience Roberta.